First - Use our convenient comparison chart to compare different fax services. Second - Watch our video below for a general overview of Internet Fax. Can Using Internet Fax Really Save Me Money? Please Contact us with your reviews of any Internet Fax Services you have tried. To Get Our Android App Click Here Make sure to enable the Security - Unknown Sources option in settings. signing up for any fax provider - buyer beware. Internet or Online Fax is all the rage. Many individuals and companies are switching over to this new way of faxing mainly because it's paperless, more secure, more economical and much more convenient since it's available wherever you have the Internet and these days that's just about everywhere. A web based fax service also has other benefits: there's no need for a traditional fax machine and no need for a second phone line. It's completely scalable to handle any business faxing requirements that may arise. It is often seen as environmentally friendly because it uses less paper and ink than traditional faxing. Online or Internet Faxing has many different names: email fax, electronic fax, and even digital or computer fax. No matter what you call it, internet fax means using your email system and the web to send and receive your faxes thru email attachments, usually in TIFF or PDF formats but there are over 30 different formats you can use. Internet Faxing is completely compatible with laptops, cell phones, PDAs... just about any device that uses the web. Most Internet faxing services provide you with a site or online interface where you can send and receive your faxes. You can also store your faxes online. Keep in mind, many providers will let you fax thru a desktop application or directly from your email program. Some of the most popular and highly used Internet fax providers are: eFax®, MyFax, RingCentral, TrustFax, MetroFax, Faxage, Send2Fax, RapidFax... among others. 1. Check for the overall quality of the service you're considering. You want good support and hassle-free faxing. Check online customer reviews and ratings. Test-driving or doing a trial run will give you a better view of the service. Most professional services will have a free trial. 2. Make sure it has good reliable customer support 24/7. Check the Support hours - many companies have around the clock support but not all. Like any business service, you want a well-informed support person at the end of that line, if you should run into any problems or need help, regardless of the time of day or night. 3. Check for competitive pricing since there are countless faxing plans and services. Most services have around $10 Monthly Fee but there are cheaper plans. Some are as low a small annual fee of around $20. Remember, buying an annual plan can save you up to 25% or more. Also check the International rates if you do a lot of business with foreign countries. 4. Check to see if there is a 30 Day Free Trial and take it! Try before you buy. Some companies also offer one month free but you only get this on your second month into the service. Regardless, like buying a car, always test drive first. 5. Check to see if there is No Set Up Fee - most companies offer this but not all. However, don't let a small set up fee discourage you from trying a particular provider - for example, FAXAGE in the chart above has a $5 set-up fee, but they also offer some of the best pricing you will find. 6. Check to see if there are No Hidden Fees as your costs can run up quickly. Just remember large faxes will cost you more and so too will international faxes. Most companies will notify you when there are extra charges over your regular limit. 7. Check to see if your chosen plan offers around 300 Combined Pages (Incoming and Outgoing) per month. This seems to be the standard although some companies offer more. Also find how much storage capacity you have with your account and the length of that online storage. Some providers are now offering "unlimited" online storage for your faxes. 8. Check to see if your plan offers no more than 10 Cents Per Minute for Extra pages. Some will offer much less so shop around. Note - some companies quote rates in pages, others quote in minutes... for pages it is assumed that it takes 1 minute or less to transmit your fax, however, with large faxes it may take longer. 9. Check what type of Fax Number you will be receiving with your plan, Local or Toll-Free. Check to see if there are any extra charges for the Toll-Free number? Keep in mind, many services or providers will let you "port" your current fax number over to their system. However, there is usually a small charge for this service. 10. Check to see if your chosen service is completely Scalable for your business and offers corporate plans. Check for special rates on large volume fax broadcasting. In addition, many providers will custom design a fax plan to meet your specific needs and most will offer special rates... there's no harm in asking. In summary: When choosing an online fax service you must first check the overall quality of the service. Best way to do that is to "test drive" the service. Next you must check all the pricing information and costs associated with your chosen service - that's why you should compare all the different providers and fax plans to find the one best suited to meet your needs. Compare - prices, number of pages, overage charges, support hours, online storage, security features, any hidden fees... consider all these things before you buy any service. Keep this checklist handy when buying any internet faxing service because it will prove helpful to you since a small amount of time doing your homework now can save you valuable time and headaches down the road. Remember, once we choose a business service like faxing, we usually keep it for years. So choose wisely. 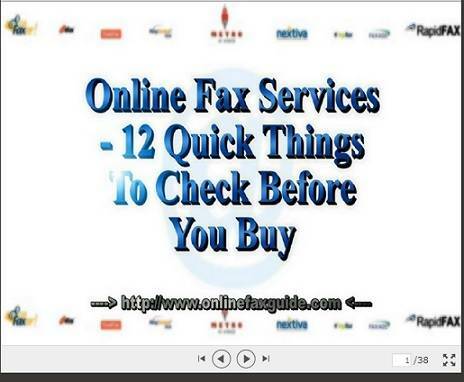 About this site: OnlineFaxGuide.com has been online since 2006 and has helped thousands of individuals and companies find the right fax service provider to meet their needs. In that same time period, thousands of our visitors have also downloaded our helpful fax guide which you can find below. It gives you much more detailed information on all the fax services and how they operate. 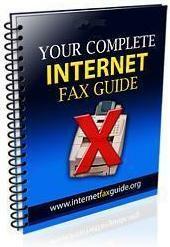 In addition, in this guide, you will also find answers to all your questions on this relatively new way of faxing. Why Use This Site? As mentioned above, thousands of our visitors have used this site to find the right fax service for their needs. When buying any product or service, the more information (comparisons, reviews, feeback) one has, the better you will be able make a smarter choice. "Become A Smarter Buyer" - that's our motto and we hope it is yours too! validate your email address before you can download our fax guide. © Copyright - 2006 All Rights Reserved. Internet Fax Service Comparison Guide eFax® and RapidFAX® are Registered Trademarks of j2 Global Communications. Other listed companies have their own Trademarks. This site respects all Trademarks.